Charles Baird was introduced to the game when he was in his mid thirties, but only started playing seriously in his mid-forties when overseas job postings stopped and he could participate more frequently. He then proceeded to amass an enviable record. In the late 1960s through early 1970s he and his partner Roger Lankenau were ranked in the top eight teams and became a formidable force upon entering the senior events. In 1982 Baird won titles in three age groups, the 50+, 55+ and 60+, possibly a record that will never be broken. He won the 65+ in three consecutive years from 1990 to 1992, and the 70+ in 1999. Over the years, there have been many great paddle players and tournament winners. But no one has won more national tournaments, or played on more courts, than Chuck Baird. Baird’s career took him from Short Hills, NJ, to Chappaqua, NY, to Washington DC, and then to Toronto and Europe, where he planted the seeds of platform tennis that grew for others to enjoy. This was exemplified by his stint in Toronto, where he served on the Board of the Canadian Platform Tennis Association and was instrumental in getting it to join the APTA. He also served on the APTA Board as Seniors Chairman. Chuck Baird’s active involvement in paddle did not begin until 1958. At that time, the Baird family had returned from a posting in London with Standard Oil of New Jersey and had moved to Chappaqua, NY. Next-door neighbor and future partner, Roger Lankenau, introduced Baird to the game when, according to Chuck, “Lankenau came walking across the property line one day holding a strange looking instrument which turned out to be a paddle.” It was love at first screen shot. Soon afterwards, former national champion and friend Bill Pardoe invited Baird to watch tournament play at the Fox Meadow Tennis Club in nearby Scarsdale, NY, to “see how the game is really played.” Fox Meadow, the birthplace of paddle, featured tournaments with the top players in the game, but also welcomed newcomers as participants. It was in this environment that Baird began his tournament paddle experience. Baird and Lankenau became regulars on the tournament circuit the following year and made it to the Men’s Nationals quarterfinals at Fox Meadow in 1962. That same year, business again took Baird overseas, this time to Paris for three years. However, the paddle bug had bitten hard and Baird flew back to the United States to participate in the 1963 National Championships, undoubtedly setting a record for the longest distance traveled by a Nationals participant. Returning from France in 1965, and at the age of forty-five, Baird decided to devote time to mastering the game of paddle. One year later, he and Lankenau won the highly regarded New Canaan Invitational Tournament and made it to the semi-finals of the Nationals at Fox Meadow as well. During the next seven years, Baird and his partner were annually ranked among the top eight teams in the country. 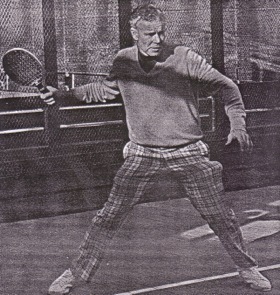 One particular highlight that Baird recalled was playing in the first televised platform tennis tournament, held at Hilton Head Island, South Carolina. That his sons, Steve and Chip, were finalists in the same tournament made the event even more memorable. As his children grew older, Chuck began entering tournaments with them as well. “This is when they learned to be tournament tough,” stated Chuck. The boys had to play well, as opponents worked on them, assuming that the youngsters were the weaker players. This experience paid almost immediate results, as Steve and Chip took the National Juniors title in 1968, and soon added the Men’s Nationals title to their list of credits. In 1982, Baird performed the hat trick, winning Men’s Senior National titles in three age groups, the 50+, 55+ and 60+. At the time of his induction in 1992, he had participated in twenty-three championships, been a finalist nine times, and had just won the National 60+ and 65+. He subsequently was a finalist three more times and won his last tournament, the Men’s Senior 70+ in 1999. He was described by Brook Kindred as a tough, tough competitor who would gladly beat his mother love and love, only to be the most tender son imaginable once the game was over. Although the sons he nurtured in the game are presently better known, Chuck Baird’s achievements on the platform tennis courts are likely to stand for generations. After four decades of paddle. Baird listed a number of reasons for his longstanding love of the game. At the top of the list was simply, ”the fun of competing with and meeting a nice bunch of guys.” He added that, “senior tournaments especially are like old home week for me.” After living in several of the country’s paddle centers, his paddle friends were countless. He especially liked playing in out-of-town events, in places like Cleveland, Detroit, and Pittsburgh where he could renew acquaintances with players he had met through the years. “Another reason I love the game is due to the smallness of the court. It brings you close to your opponent and while this can cause the competition to get very heated, it also contributes to the basic friendliness of the game,” Baird observed. The ability to get outdoors in the winter and play at night were other reasons cited as making the game so appealing to him. “What can be better than a combination of friendly competition, good exercise, and being outdoors?,” said Baird thoughtfully. It cannot be said any better. Baird grew up in Wantagh, Long Island, NY. He was a good athlete, playing football and tennis at Freeport High School and continuing in these sports at Middlebury College. While at Middlebury, and with World War II underway, Baird enlisted in the Marine Corps in November of 1942. He reported to Hanover, NH, shortly thereafter and completed his last two semesters at Dartmouth College before entering active duty. He then served sixteen months in the Pacific and came home as a first lieutenant. After returning to civilian life, Baird worked briefly for his father as a builder before accepting a job with Manufacturers Trust bank. Next came a day job in the treasury department of Standard Oil of New Jersey, while nights were spent at New York University where he earned his MBA. As he rose through the ranks at Standard Oil, he had postings in London and Paris. His personal life was also on the move. Baird and his wife, Norma, who had met on a blind date, were married in 1947. As their family grew, little did anyone anticipate how great an impact this family would have on the game of platform tennis. Daughter Susan arrived first and then came the “Baird Boys,” Steve and Chip. Finally, Nancy was born while the family was living in London. While Steve and Chip’s paddle legacy is both well known and well documented, Nancy was also active in paddle and, in 1976, personally put together the first Princeton University platform tennis team. When Baird was appointed as Assistant Secretary of the Navy (1966-1967) by President Johnson, the family moved to Washington, D.C. He soon rose to Undersecretary (1967-1969), the number two position in the Navy and, during his period in Washington, Chuck was an active member of the mid-Atlantic paddle community. Subsequently he joined The International Nickel Company of Canada (now known as INCO Ltd.), moved to Short Hills, NJ, and began working his way up to CEO and Chairman, with an executive posting in Toronto along the way. Baird died in 2009 at his home in Skillman, NJ, after a struggle with Alzheimer’s disease.